This week, in my part of the world, the summer holidays are officially over. Schools and nurseries are back in session; baby and toddler groups are up and running from Monday. MM and I (by which I mean: "I") are planning to try out several new groups. I'm hoping to find a handful which we can walk to, afford and don't have to block book, which fit around MM's current (increasingly early) naps and our friends' more hectic schedules, and - most importantly - which we both actually enjoy attending. But I haven't felt in a rush for the groups to start up again. Last summer was a little different. 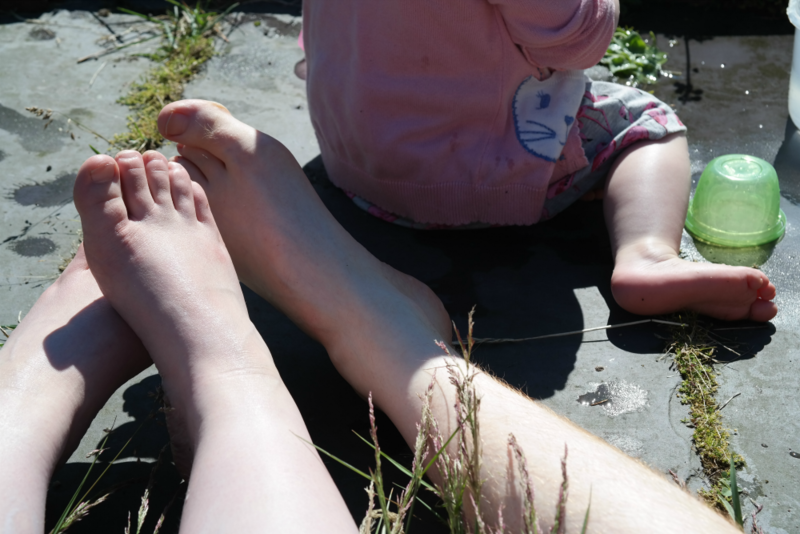 Last summer, MM was tiny and I was still feeling fairly overwhelmed; having something planned for every single day helped me to cope - it gave me an opportunity for adult conversation and the reassurance that my baby was receiving some sort of stimulation. All those long, empty weeks without groups to go to were daunting. But this summer I haven't felt that anxiety. Maybe for a few minutes on a Sunday evening, at the thought of Steve going back to work, but over all: no, I've been relaxed. It's a lovely stage we're at. MM would be happy to spend every morning and every afternoon at the park; she can be easily entertained in the garden (especially now we have a fully functional slide); and she will potter around indoors by herself if I need some time to decompress. She's happy because she can choose which toy to play with or which book to read; she sometimes opts to play on her own. I don't even feel guilty about letting her watch TV these days because I know some of her enormous vocabulary can be credited to CBeebies; her tastes are for mellow, calming shows (also, sadly, any of Justin Fletcher's vaguely offensive output) and she wanders away when anything else comes on. So, home life is pretty easy. And this summer I've been really aware of what a fortunate position I'm in. I don't go out to work. I have only the vaguest idea of the day and the date at any given time. I feel a need to fill our days with as little pressure and structure and timetabling as I can get away with. I'm lucky. MM and I have had a summer. A proper summer (despite the weather). I mean a proper summer like I had when I was a kid: long, aimless days outdoors. Occasional visits from grandparents. Picking wild berries. Putting our feet up and reading books. Running around the garden. I don't feel an urge to cram MM's days with as many experiences as possible. She has no concept of history yet so castles and museums mean nothing to her. One park and one ornamental garden and one patch of woodland looks the same as another to her so we stick to the ones in our neighbourhood. She doesn't need expensive trips to entertainment parks; her demands are not that high. There is plenty of time in the future to introduce her to Big New Things. Right now, she's concentrating on the little ones. Playing with the same 300 Mega Bloks over and over and over again until she's mastered piling them up in ways which don't fall over; reading the same books over and over and over again until she can speak along with them, word perfect; clambering around the same play park over and over and over again until she can get to the top of the climbing frame without any help. She is all about repetition. It's how she learns. Trying and trying and trying again. And that has made this summer slow and easy and relaxed and lovely, pottering around at home.